The nightly ritual of shutting down the house is well ingrained. I moved through the rooms, checking doors and windows, shutting off lights and set up the coffee machine. My last stop before bed was the bathroom. My bath is a huge, skylighted, claw-footed-tub sanctuary. It is filled with my most intimate photos from childhood and beyond. The light blazed on and sitting on my shower curtain rod was a gray squirrel. I screamed. It screamed. It leapt to the floor. I slammed the door. There was no way I was prepared to deal with a live animal in my bathroom at that hour. I crawled into bed and hoped for the best. The door was closed, the light off and hopefully it would have somehow managed to find a way out by morning. Strange dreams populated the night, an eery kaleidoscope of visions that all involved wildlife and sharp teeth. At 3am, just as I realized my hand was on the doorknob, I woke up enough to shuffle down the hall to the half-bath off the kitchen. Better safe than rouse the sleeping critter. My plan in the morning was to open a window, grab a broom and shoo the little scamp out. Obviously, my head wasn’t connecting to my heart. I feared cardiac arrest as I slammed and swept the room from the doorway, yelling obscenities at the top of my lungs. The squirrel darted with amazing speed, launching itself from the towels to the top of the curtain rod and back to the linens hanging on the wall. At one point, screaming like a banshee I entered the room. He or she was once again cornered in the shower stall and I could hear it screaming back at me, “Look lady, this is getting us no where! !” I lunged around the corner and stabbed at the shower stall, bristles flying. Then there was silence. “Good. Much easier to relocate if she/he is stunned or dead.” I peeked around the curtain and the thing was hanging from my shower scrubby. “IIII EEE! !” and we were off again. This critter was not getting the message that there was an open window through which it should exit. I retreated to reconsider my plan. I searched for Skeedles the cat. If I threw her in and closed the door, perhaps she could finish the critter off and I could remove it. That would no doubt involve blood and guts, something I don’t relish. It could also impose injury on the cat. I called Wilson and prevailed upon him to come armed with a trap, gloves, whatever it would take to remove the beast. He appeared with a towel. It took me several hours to calm my nerves and clean up the mess. All day I struggled to explain the concept of “inside toys vs. outside toys” to the dog and cat. Alice insisted her bones were tastier on the living room carpet. The fluffy “inside toys” were scattered around the backyard. Skeedles lurked and looked attentive as I described in great detail the difference between Indoor vs outdoor critters. This entry was posted in memoir. Tagged gray squirrels, humor, life after 50, memoir, New Hampshire living, pets, wildlife. Oh my! I’m still laughing! I can picture you now. At least dead, outside toy was dead, no need for broom and banshee noises. It’s funny now Laura but at the time I was terrified!! Maybe you weren’t laughing at the time, but your great story gave me a laugh from beginning to end. You are right Susan. It is very funny…now! This made me LAUGH OUT LOUD! I remember coming home late after a night out with the girls. We’d stopped at a Burger King and I had half a cheeseburger in a Styrofoam take-out box to store in the fridge for the next day. Walked into the house only to be confronted by a BAT!!! I shrieked and ran straight upstairs to lock myself in my bedroom. Minutes later I realized I had a serious need to pee but NO WAY was I going to open that door! So I opened the window, chucked the leftover sandwich and relieved myself in that little yellow container. Ack!!! Oh Julie, you beat my story by a mile. I don’t know why those “outdoor” pets are so upsetting when confronted indoors. It took me all day to get over the shakes. A terrific story! I laughed all the way through. Thanks Aline. I can laugh now that my blood pressure has returned to normal. What a great story, Cheryl! Amazing what your mind will conjure up when there is something strange going on! 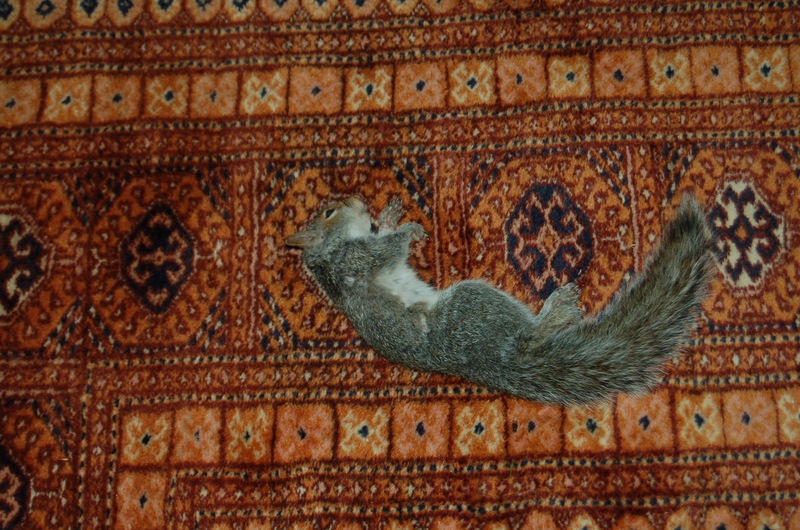 I used to work for people who had squirrels come down their chimney through the fireplace to eat their houseplants. They made quite a mess every time. Well, there you go, Allen… outside pets/pests should remain there!! Skeedles wanted to reassure you that the problem was taken care of? Duh! How could I miss her unmistakable message. Thanks Phil, that is why you are such an asset to the realm you serve! Wow, I really do hate snakes, Terri. I’m not sure why furry things in the house upset me so but it was beyond creepy!! Thanks for the support. I know I shouldn’t laugh…. I wonder who was the more firghtened, the squirrel or you? I wonder too if the dead squirrel was the same one? Holy Hannah I laughed out loud for real and spit tea on my tablet screen. Damn that was funny. A nicely told tale, readable and enjoyable! Thanks wordpixman! I will check out your blog! !